Hello and Happy Congenital Heart Defect Awareness Day! I know you are shaking your heads and thinking WHAT??? It's Valentines Day. Well you are right it is Valentines Day but it is also CHD Awareness Day. I have become all too well aware of CHD. I have 2 beautiful nephews who were born with heart defects. They have been through a lot. My sister has been through a lot, (they are doing great now). It's sad and hard and horrible what these children and their families have to live through. Many don't make it. 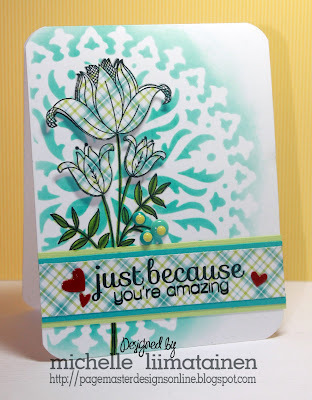 Which is why we are having a Card Drive and Blog Hop today. My friend Amiee's little Girl Katy was one who lost her battle with CHD. All the details for the card drive can be found HERE (there is a permanent tab under my blog header that will bring you right to the rules/information page), as well as a list of sponsors who have offered up some phenomenal prizes to be raffled off to those who submit cards. Please read the rules carefully. The card drive will run from February 14th thru April 15th. I used some Distress inks (picked raspberry and peacock feathers), THIS stencil from Penny Black, and this 6x6 paper pad by Lawn Fawn. 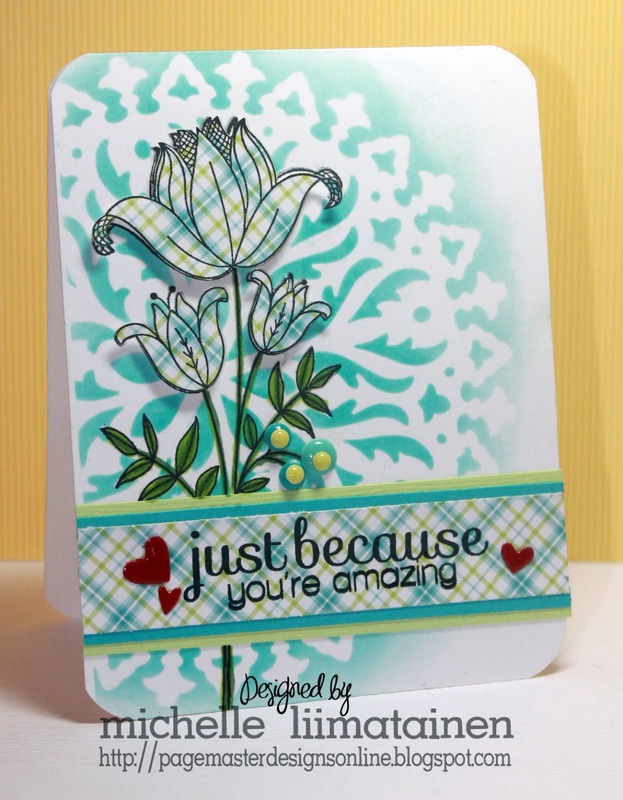 The flower is an older Hero Arts Stamp, which is still a favorite to this day. The sentiments are from this Simon Says Stamp set and this one too. Thank you so much for stopping by. If you got here first you can just click below to Heather's blog and it will start you from the beginning of the hop. Your next and final stop is to Amiee's blog. We can't wait to see all the creations that you send in. Make sure to head to THIS page to read the rules, and to print out your form to send in with your cards so that you will be eligible for prizes!!! Our sponsors have been so generous!!! Thank you for stopping by. I really do appreciate it. Your cards are beautiful and you have inspired me to breakout the stencils I hoard.. Such beautiful cards. Wonderful cause.